t has been twenty-five years since Mark Hofmann, a returned missionary of the Church of Jesus Christ of Latter-day Saints (LDS), forged numerous historical documents, blew up two innocent people with pipe bombs, and was given a plea bargain instead of going to trial. Why would the prosecuting attorneys offer a plea bargain when Hofmann had been charged with thirty-two felony counts and two murders? It becomes clearer if you understand the tremendous power the LDS Church has over the state of Utah. Placing Mark Hofmann on trial would have meant calling LDS Prophets and Apostles to the witness stand. These LDS Church Authorities had been utterly fooled by him into purchasing thousands of dollars worth of forged documents relating to early Mormon history. Nothing in Mark Hofmann's past indicated a dark, sinister side. He was born and raised a Mormon and went on his two-year mission to southwest England, returning in 1976. Married in the Salt Lake LDS temple in 1979, outwardly Mark appeared to be a faithful Mormon. However, as he learned more about problems in early LDS history, he found an easy target to exploit in the LDS Church's desperate need for control of its history. Since the beginning of Mormonism, founder Joseph Smith has been accused of fraud, deceit, folklore, magic and mysticism. In 1834 E. D. Howe published the first exposé of Mormonism titled Mormonism Unvailed, which contained a number of statements by the Smiths' neighbors, accusing them of deceit and seeking buried treasures through the use of magic. One neighbor of the Smiths charged that he accompanied Joseph Smith, Jr., and his father, Joseph Smith, Sen., on a nocturnal treasure hunt where he was assured that they would find "two or three kegs of gold and silver, some feet under the surface of the earth." But after drawing two magic circles, lining one with a row of witch hazel sticks, driving a steel rod in the center, digging a five foot trench around the rod, an evil spirit "caused the money to sink." Joseph Smith, Sen., informed him that "we had made a mistake in the commencement of the operation; if it had not been for that, said he, we should have got the money." The farmer went on to state: "When they [the Smiths] found that the people of this vicinity would no longer put any faith in their schemes for digging money, they then pretended to find a gold bible, of which, they said, the book of Mormon was only an introduction." [Joseph Smith stated] he had a certain stone, which he had occasionally looked at to determine where hidden treasures in the bowels of the earth were; . . . that at Palmyra he pretended to tell, by looking at this stone, where coined money was buried in Pennsylvania, and while at Palmyra he had frequently ascertained in that way where lost property was, of various kinds; that he has occasionally been in the habit of looking through this stone to find lost property for three years, but of late had pretty much given it up on account its injuring his health, especially his eyes—made them sore; that he did not solicit business of this kind, and had always rather declined having anything to do with this business. I will now give you a description of the manner in which the Book of Mormon was translated. Joseph would put the seer stone into a hat, and put his face in the hat, drawing it closely around his face to exclude the light; and in the darkness the spiritual light would shine. A piece of something resembling parchment would appear, and on that appeared the writing. From its beginning, the LDS Church has tried to distance itself from Joseph Smith's early magical practices and provide a legitimate explanation of its origins. For instance, official LDS artwork never depicts Smith translating with his head in his hat, staring at his seer stone. Instead, he is shown sitting at a table looking at the gold plates. Into this fertile ground of protecting church history at all costs, Mark Hofmann cultivated his forgery scheme to make money and make the LDS Church look foolish—he succeeded on both counts. Hofmann's first big score was the "Anthon Transcript." Martin Harris, the financier of the first printing of the Book of Mormon in 1830, was skeptical at first of mortgaging his farm to pay for the printing without some proof of the Golden Bible. Joseph Smith would only let him heft the box that supposedly contained the "Golden Plates" from which the Book of Mormon was to be translated, but this wasn't enough to satisfy the wealthy farmer; he wanted confirmation. So, Joseph supposedly copied characters from the gold plates and Harris took them to New York City to have the scholars of the day validate the characters. The characters were not of any known language, Smith explained to Harris, but an unknown language called "Reformed Egyptian." The Anthon Transcript in the Community of Christ Archives, Independence, Missouri. Harris eventually found his way to Charles Anthon, a professor of Greek and Latin at Columbia College in New York. No one knows for sure what took place at this meeting but Harris came back declaring that Professor Anthon had identified the characters as Egyptian, Chaldaic, Assyriac and Arabic. When Professor Anthon later heard that the Mormons were saying he had validated the characters he wrote a blistering denial: "The whole story about my having pronounced the Mormonite inscription to be 'reformed Egyptian hieroglyphics' is perfectly false." Although an early copy of the Anthon transcript has been preserved in the Community of Christ Library (formerly the Reorganized Church of Jesus Christ of Latter Day Saints) in Independence, Missouri, the original Anthon Transcript which Martin Harris had taken on his journey was believed lost. 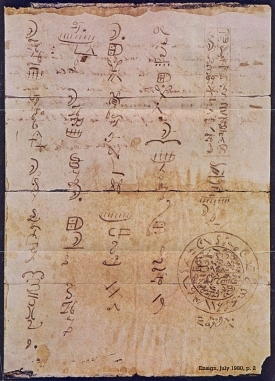 Professor Anthon had described it as a document with vertical columns of strange characters with a circle of characters at the bottom. Amazingly, Hofmann claimed to find the long-missing document in 1980. This incredible document put Mark Hofmann on the inside track with the leadership of the LDS Church. Mark fooled every senior LDS Church leader and struck a deal to exchange the document for items from the LDS Church archives "worth about $20,000." At the time of Joseph Smith's death in 1844, he had not designated a successor to lead the church. There had been talk that Smith had bestowed a blessing on his eleven-year-old son, Joseph Smith III, indicating that he was to be Smith's successor. But due to the son's age, the leaders bypassed him in favor of mature leadership. This led to competing claims between Brigham Young and Sidney Rigdon. The December 15, 1844, issue of the Times and Seasons, the LDS newspaper, had an article denouncing Rigdon's claim of leadership. Young soon won the favor of the majority of Saints and assumed leadership. After the main body of Mormons left Illinois and moved west a number of those who stayed behind, who denounced polygamy and refused to follow Brigham Young's leadership, formed a new church. They called themselves the Reorganized Church of Jesus Christ of Latter Day Saints. They insisted that Joseph Smith's son should assume his rightful place as president of the church. Joseph Smith III was persuaded to assume leadership of the new church in 1860. Thus began the long-running dispute regarding who was Joseph Smith's rightful successor, Brigham Young or Joseph Smith III, and which church was the true body of Joseph Smith's followers. In 1891 the RLDS Church filed suit against the Church of Christ (Temple Lot), another splinter group, claiming title to the parcel of land in Independence, Missouri, that Joseph Smith had designated as the place for a future temple. During this trial the question of Smith's rightful successor was discussed. James Whitehead, Joseph Smith's personal secretary in Nauvoo, testified that "it was declared by Joseph Smith himself that the selection and ordination of his son Joseph as his successor in office had been made, and the people agreed to it, by a vote in the usual way, voting by the uplifted hand." 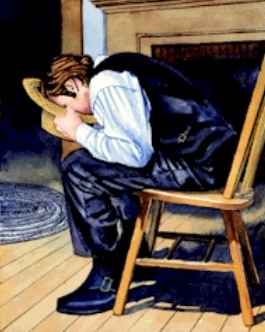 Joseph Smith III also testified that he remembered "being called in his [Joseph Smith's] office, or into a room adjoining his office, and receiving the laying on of hands, and a prophetic blessing or setting apart, whatever it may be called." He then related two more events where Joseph Smith laid hands on his head and appointed him to be his successor. The document, dated January 14, 1844, began, "Blessed of the Lord is my son Joseph, who is called the third . . ." Farther down, the key sentence read, "For he shall be my successor to the Presidency of the High Priesthood; a Seer, and a Revelator, and a Prophet, unto the Church; which appointment belongeth to him by blessing, and also by right." . . . Looking for a buyer, Hofmann showed LDS church archivist Don Schmidt a photocopy of the blessing on February 16. Schmidt immediately recognized the importance and potential controversy but kept a poker face. "I'd have to see the original." Hofmann explained to Schmidt that "It came in a collection I purchased from the Bullock family in Coalville [Utah], from Allen Bullock to be specific." When the LDS Church did not jump at the chance to buy it, Mark contacted the RLDS Church. Their historians expressed interest but needed time to make the arrangements. He promised them the document and agreed to wait until the church could make the purchase. However, he reneged on his promise and sold it to the LDS Church "for $20,000 in trade, again accepting various forms of early Mormon coins and currency." When Richard P. Howard, RLDS historian, heard that the document had been sold to the Utah church he was shocked. This created a public embarrassment when it became known that the two churches were struggling over who should own the document. Eventually the LDS Church agreed to turn over the blessing document to the RLDS Church in exchange for a copy of the rare 1833 Book of Commandments. Hofmann's career was in full swing. "During the first few months of 1981, Mark Hofmann had made $52,000 in cash and trade on Mormon documents alone." He continued to "find" more documents, many of which were sold to various collectors but not made public. In January of 1983 Mark met with Gordon B. Hinckley, a member of the LDS First Presidency, to offer him a new find, an 1825 letter from Joseph Smith to Josiah Stowell, the man who had hired Joseph to use his stone to search for buried treasures. In the letter Smith supposedly told Stowell ". . . since you cannot asertain any particulars you should not dig more untill you first discover if any valuables remain you know the treasure must be guarded by some clever spirit . . ." The letter would give support to the charge of Joseph Smith's involvement in the occult. Hinckley handed Mark a check for $15,000 for the document. In March, Hofmann showed Hinckley another document, the supposed original 1829 contract between Joseph Smith, Martin Harris and E. B. Grandin, relating to the printing of the 1830 Book of Mormon. This in turn was purchased by Hinckley on behalf of the LDS Church for $25,000. Unfortunately for all concerned, these documents would eventually be exposed as forgeries. In 1983 Mark Hofmann started telling a few friends that he had uncovered a letter, which was later known as the "Salamander Letter," supposedly written by Book of Mormon witness Martin Harris in 1830. Believing the whole translation of the Book of Mormon was steeped in mysticism and fraud, Hofmann invented a letter that played perfectly off of the claims of magic in E. D. Howe's 1834 book. When Mark read the Salamander Letter to Michael Marquardt, his reaction was that it sounded "more like a Grimms' fairy tale than a Sunday-school lesson: kettles of money guarded by spirits, seer stones, enchanted spells, magic 'spectacles,' ghostly visitations. And instead of a benevolent angel, a cantankerous and tricky 'old spirit' who transforms himself into a white salamander!" The Salamander Letter would challenge the religious framework of the beginning of Mormonism, casting it in the category of folk magic rather than divine revelation. Hofmann, possibly worried that he was "finding" too many documents, asked his associate, Lyn Jacobs, to offer the document to the LDS Church in exchange for a gold coin minted by Brigham Young or a copy of the rare 1833 Book of Commandments. But Hinckley was leery of doing business with Jacobs, someone he had just met, and wasn't sure if Jacobs would keep the document and transaction a secret. In order to avoid directly involving the LDS Church in the procurement of this document (too much publicity), Hofmann worked a deal with a faithful LDS member, a wealthy businessman named Steve Christensen, to purchase the document for $40,000 to prevent it from falling into the "wrong hands." The idea was to allow time to lessen interest in the document and then Steve could donate it to the LDS Church. 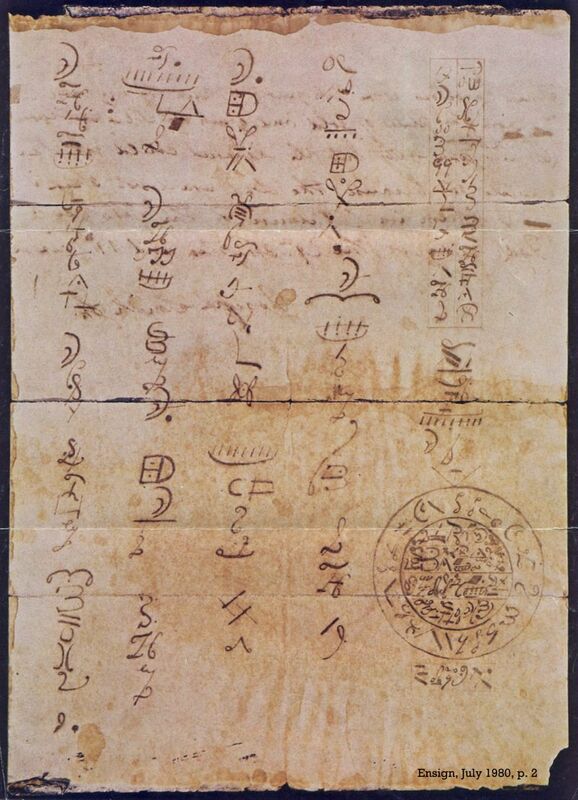 Historians and researchers were hearing bits and pieces of the newly found letter and anxious to see the original. Little did the church realize that Mark was the deliberate leak on the news stories of his finds. As soon as Jerald Tanner was able to get a typed transcript of the Salamander Letter he began researching the contents. He soon became concerned that it was a forgery; too many concepts and phrases seemed to be taken from E. D. Howe's book and a letter by Joseph Knight, a friend of Joseph Smith, recently made public in a BYU Studies article. whether the salamander letter was consistent historically with its time and apparent circumstances. It led [Ronald] Walker, [Dean] Jessee and [Brent] Metcalfe down a road that for the most part had been taboo for Mormon scholars in the past, the study of Joseph Smith's involvement in the occult and money digging. During months of research, they found an abundance of material, ranging from court records of his trials in Bainbridge, New York, to obscure writings by early disciples. 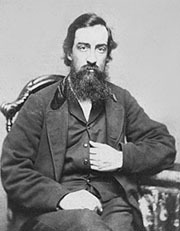 This information indicated that during the same period of time Smith claimed to have been led to a buried cache of gold plates by the angel Moroni, he was trying to make his living with claims of supernatural powers which enabled him to locate buried treasures of gold and silver with a seer stone and other superstitious occult practices. Late in August , almost eight hundred people gathered in a Salt Lake City hotel for the annual Sunstone Theological Symposium. Even before the conference formally opened, the hotel lobby was abuzz with speculation about the secret salamander letter and reports of another secret letter that purportedly linked Joseph Smith to folk magic. . . .
As the church history buffs filed into the meeting, Sandra Tanner stood in the lobby of the hotel handing out a pamphlet headlined, "The Money-Digging Letters," in which her husband expressed strong reservations about the Martin Harris letter. Jerald expanded his pamphlet questioning the authenticity of Hofmann's find in October of 1984 and reiterated his doubts in the January and June 1985 issues of the Salt Lake City Messenger. But Mark Hofmann had little to fear. Jerald Tanner's arguments, as an apostate Mormon, were not taken seriously. By 1985 Hofmann had been busy creating a number of historical forgeries in addition to his documents relating to Mormonism. Many of these had been sold to private collectors, thus not making the news. In spite of all of his document sales Mark was in financial trouble. He was flying back and forth to New York City and other places, supposedly searching for antique documents, and spending money like there was no end to its source. He was also attempting to purchase a very expensive house in one of the most affluent neighborhoods in Salt Lake City. Needing a document that would make him more financially secure, in March of 1985 he claimed to find a copy of the "Oath of a Freeman." Mark Hofmann's forged "Oath of a Freeman"
"It was as if you had never heard of the Holy Grail. Then one Sunday you go to a garage sale and you find a little silver chalice or pewter cup and you say, 'Hey, far out!' So you pick it up. You also pick up an old Sotheby's catalog. Then on the way home, you're reading through the catalog and you find a notice to the effect that the Holy Grail was lost in whatever A.D. And basically it looks precisely like the item you just picked up. You say, 'Goddam! I just bought that this morning at the garage sale!' "
But the Library of Congress was not quick to accept the authenticity of Hofmann's "Oath." They needed time to do research and tests on the document, time Mark did not have. Unable to wait for the sale of the "Oath of a Freeman," with mounting debts and creditors at his heals, Mark returned to forging Mormon documents. The McLellin Collection was the fraud that would finally bring Mark Hofmann down. William E. McLellin was ordained an LDS apostle in 1835 but was excommunicated in 1838, becoming an ardent critic of the church. While retaining a belief in the Book of Mormon, McLellin felt Joseph Smith had brought false teachings into the church, such as priesthood and polygamy. Leaders in the LDS Church had long known that McLellin had letters and papers dealing with controversial issues of Joseph Smith's life. In 1879 the RLDS Church had printed a letter from McLellin to President Joseph Smith III, Joseph Smith's son, in their paper, The Saints' Herald, in which he insisted that Emma knew of her husband's adultery. In 1878 Apostle Joseph F. Smith, who would later become the sixth president of the LDS Church, visited McLellin. This interview is recorded in the 1938 book, Life of Joseph F. Smith. At this meeting McLellin asserted: "Emma Smith [Joseph Smith's widow] told him [McLellin] that Joseph was both a polygamist and an adulterer, . . . He also said Joseph had given a false revelation in 1829, . . ." Due to such accounts, rumor spread that his diaries and papers had been preserved and contained many incriminating documents that would embarrass the LDS Church. But no one seemed to know who owned the fabled collection. Until now. A month after Hofmann reported finding the "Oath of a Freeman," word on the street was that the McLellin Collection had been located. In order for Mark Hofmann to get top dollar for the collection he had to say it included a laundry list of items. He told one friend it contained part of Joseph Smith's papyri, others were informed that the McLellin Collection contained "Joseph Smith's revelations and letters—actually a good orange crate full of letters and documents—including six little diaries handwritten by McLellin from 1831 to 1836, one for each year." However, Hofmann was unable to forge enough documents prior to the deadline for the sale. The price tag was set at $185,000 and he was simultaneously working several different people, as well as the LDS Church, in the scam. With President Hinckley out of the country at the time, Hofmann had to look elsewhere for a buyer. He turned to his friend Steve Christensen, the purchaser of the Salamander Letter, and told him he needed $185,000 to acquire the McLellin Collection. Steve contacted Elder Hugh Pinnock, a senior member of the Quorum of Seventy (an LDS General Authority, just under the position of Apostle), who in turn, on June 28, 1985, made a phone call to First Interstate Bank and arranged the loan. Mark simply had to go pick up the check. Evidently, such transactions had been done before. During the police investigation of the murders, Harvey Tanner, head loan officer at First Interstate Bank, told detectives that he "had been reassured that Hofmann was good for the money, the church was behind it, not to worry." He went on to state that "we had done business with Pinnock before, obtaining money for the church without the church being involved." Hofmann had also borrowed money from several other Mormons with promises of providing the McLellin Collection. Playing both ends against the middle, time was running out. Hofmann was under a great deal of pressure to meet his various obligations. Steve Christensen had entered the picture again as Mark was delinquent on his $185,000 loan arranged by Hugh Pinnock. "The Brethren" had elicited Steve's help to complete the McLellin transaction through a wealthy LDS Mission President in Nova Scotia, Canada. But Hofmann was becoming more and more desperate in the pressure cooker situation that he had created. Sensing the need to divert attention away from his mounting debts and his inability to produce the fictitious documents, Hofmann began to formulate a devious plan. If he could get Christensen out of the picture then he would not only be relieved of some immediate financial pressure but the ensuing drama of Christensen's death could refocus attention and buy him time to produce more documents. On Tuesday October 15, 1985, two separate bombs took the lives of Steve Christensen and Kathy Sheets. The bomb set for Steve Christensen, left at his office door in downtown Salt Lake City, was especially brutal, being filled with nails meant to shred its victim. Gary Sheets was the intended target for bomb number two; however, his wife, Kathy, found the package containing the bomb outside their home and became the victim of its deadly power. Mark Hofmann later commented: "At the time I made that bomb my thoughts were that it didn't matter if it was Mr. Sheets, a child, a dog." No one is sure who was the intended victim of bomb number three. Mark Hofmann was in downtown Salt Lake City in the process of delivering the bomb when it went off prematurely in his parked car. Severely injured, but not killed, Mark was initially thought to be another innocent victim; however, the investigation quickly shifted to him as the suspected bomber. Police Detective Don Bell interviewed him at 1:12 in the afternoon on October 17, the day after the bomb exploded in Hofmann's car. "Elder Pinnock, this is the deal," Bell began, notebook in hand. "This is a homicide investigation. Do you know Mr. Hofmann?" Pinnock paused and reflected a moment. "No, I don't believe I do." "The Church is upset because we [KSL-TV] said they helped arrange a loan. Well, they did! They say it was an individual, not the Church, but that's baloney. It may have been an individual who placed the call, but he was a Church official, sitting in his Church office, on Church time, using a Church phone, and he did it for the . . . benefit of the Church. Nobody else wanted that McLellin Collection except the Church. And the Nova Scotia mission president doesn't collect documents. He was just a big-bucks guy who said 'If you need help, I'll help you out.' If the Church says they weren't helping arrange any buyers for anything, how do you explain the fact that the Church volunteered to get an armored car to go down to Texas and pick the Collection up?" Stott and Biggs shifted uneasily in their chairs. With all the time in between to recollect those meetings, he still couldn't remember a thing. "Was he ever in your office?" Stott asked. "Probably!" thought Biggs. Now, he was even forgetting what he had admitted in the press conference. . . . Surely he remembered the morning, only days before the bombings, when Hofmann came to tell him the Kinderhook plates "might be available for the right price"? He did remember the Kinderhook plates? "I don't know a whole lot about them," Hinckley said dryly. Biggs thought, This is Hinckley. He's telling us he doesn't know a whole lot about the Kinderhook plates. My God, even I have learned a little about them in this investigation. He has to know what they're about. . . .
Stott and Biggs pressed. Surely he knew that Steve Christensen had been called by Church officials at all hours of the night to go out and find Hofmann and get him to repay the First Interstate loan? Hinckley shrugged his shoulders. . . . Hinckley could recall nothing. . . .
After another hour of evasions, memory lapses, and sermonettes, Biggs lost his patience. "President Hinckley. This has been in the news—people have died—isn't there any way we can get some information about your meetings with Hofmann?" The interview then focused on the upcoming preliminary hearing. When Bob Stott finally worked up the courage to talk about Hinckley's testimony at the upcoming preliminary hearing, [LDS attorney] Wilford Kirton jumped in. "President Hinckley doesn't wish to testify at the hearing. We think it would be in everyone's best interests to not have him testify." Someone suggested that he would have to testify at trial. "You don't understand," said Kirton imperiously. "President Hinckley does not wish to testify at the hearing, at the trial, at anything." "This isn't that significant, as it relates to Church matters," he said softly. "It's the Church that matters. You have to consider the Church first. I don't wish to testify." . . .
"I think it would be in the best interests of the Church," he added in the same mellow voice, "if you simply dismissed the charge." Dismiss the charge? Biggs was aghast. It took them a moment to realize that he meant only that Stott should dismiss the charge on the Stowell letter, which would let Hinckley off the hook as far as testifying at the preliminary hearing. . . . But Bob Stott wasn't ready to do that. "We are not going to drop the charge," he said after he regained his composure. But he did have a compromise suggestion. "If we can get the defense to stipulate as to your testimony, we won't have to call you." When comparing the notes of the investigators of Hofmann's crimes, there is no doubt that Gordon B. Hinckley was lying to them. In February of 1986 Mark Hofmann was arrested. The case against Hofmann was overwhelming. In addition to the two murders, he had forged dozens of documents and defrauded multiple people, including the LDS Church, of possibly two million dollars. In January of 1987, he pled guilty to second-degree murder and theft-by-deception to avoid the death penalty. Everyone had been expecting a trial where he would be convicted of First Degree Murder and receive the death penalty for his despicable murders; yet he only received a life sentence, to be served at the Utah State Prison. The question on the streets of Salt Lake City was "Why?" It was clear to everyone by now that Bob Stott [prosecuting attorney] was determined to avoid a trial no matter what. Said one policeman when the news of the bargain spread though the department like the smell of a gas leak, "Even if we had a confession, Stott would have given Yengich [Hofmann's attorney] anything he wanted. Later, when a Los Angeles Times reporter flew to Salt Lake City to cover the breaking plea-bargain story, he told Dawn Tracy [Salt Lake Tribune reporter] that the most surprising aspect of the entire case was the attitude of the prosecution. "The typical prosecutor," the reporter said, "goes out and gets the bad guys. He goes out and stirs things up. Here, they're so nice and cooperative. What a nice plea bargain. In any other state, you'd see this thing go on trial, because that's how prosecutors' reputations are made. Going to trial and getting bad guys, big splashes, lots of exposure. Here you have a nice plea bargain." "Hey," said Tracy, "You don't rise in this state embarrassing the Mormon Church or making them look bad." The handling of the Mark Hofmann case is an example of Mormonism's attitude toward truth: "faith before facts!" In the aftermath of all the negative publicity and books exploring the Hofmann case and early LDS history, the LDS Church announced that its historians had "embarked on a massive study of the books and news articles in an attempt to assemble a master list of errors, misquotes and exaggerations. 'Our response to all the allegations made against the church will be made public in about 60 days,' [Richard P.] Lindsay said." However, it would be another four years before Richard Turley's book, Victims: The LDS Church and the Mark Hofmann Case, would appear. While the book was seen as mainly a futile effort in damage control, there was one item of interest buried in the middle of the book. On page 248 of Turley's work he states that "March 1986 brought a startling discovery," and goes on to explain that at that time church officials became aware that they already had an important part of the McLellin collection. The McLellin journals for 1831 through 1836 had been gathering dust in the LDS First Presidency's vault. The church, in fact, had the documents since 1908, but not being catalogued, they had been pushed aside and forgotten. These journals were discovered before Hofmann's preliminary hearing and yet this information was not passed on to the investigators. Thus the church suppressed a key item that would have gone to proving that Mark did not have the McLellin collection, which would have helped to establish motive for the murders. Investigators certainly would have subpoenaed the McLellin journals if they had any idea that the church had them. Evidently the church leaders deliberately kept Hugh Pinnock in the dark about the journals so that when he was questioned during the preliminary hearing he could truthfully say, as far as he knew, the church did not have any part of the McLellin papers. In order to keep Gordon B. Hinckley off the witness stand during the 1986 preliminary hearing, the church submitted a statement that Hinckley "has never seen nor possessed nor has any knowledge of the whereabouts of a document or a group of documents known as the McLellin Collection." However, Hinckley, Oaks, Turley, Dean Larsen, Dean Jessee, Glenn Rowe and staff in the LDS Historical Department, all knew the church had the McLellin papers in the vault. Writer Robert Lindsey observed: "Whatever else they had done, Hofmann's documents had stimulated a burst of historical inquiry regarding Joseph Smith's youthful enthusiasm for magic and the occult and it did not wither after his conviction . . . and it was unlikely that those in the Church Administration Building would ever be able to contain fully the fires of intellectual curiosity that Hofmann had helped fan." Today Joseph Smith's involvement with the occult is generally conceded, even by LDS historians. Over the past twenty-five years numerous historical studies have been published, leaving Smith's occult involvement an unquestioned part of the story. Will He Ever Be Paroled? Yes, he finally conceded, he might have discussed with other inmates the possibility of killing members of the Board of Pardons. Then he admitted that he had done so, but quickly added it hadn't been his idea: Other inmates had proposed the idea to him. Without sufficient evidence to prove Mark had actively tried to hire someone to kill members of the Board of Pardons, no additional charges were made. With that, however, all hope of receiving a parole vanished like smoke in the wind. Another Hofmann document has come to light this year. An article in the Deseret News for September 7, 2010, announced "For the past 27 years, historians have identified William Edwards as a participant in the 1857 Mountain Meadows Massacre. But forensic document examiners now say the 1924 affidavit that implicated Edwards is a forgery linked to convicted bomber Mark Hofmann." The affidavit has been quoted in three books dealing with the massacre: Massacre at Mountain Meadows by Ronald W. Walker, Richard E. Turley, Jr., and Glen M. Leonard; Blood of the Prophets by Will Bagley; and Innocent Blood: Essential Narratives of the Mountain Meadows Massacre by David L. Bigler and Will Bagley. Hofmann's documents have led some people to dismiss any negative references relating to early Mormonism as possible forgeries. However, those writing on LDS history today are careful to reference documents with a known history. Most early letters and diaries relating to Mormonism have been acquired from known family members or have always been in the possession of a well-established institution. Usually a number of people have been aware of the documents for years. For instance, David Whitmer, Martin Harris, the Smith's neighbors, etc., made statements that were published during their lifetime. On the other hand, Mark Hofmann could not disclose who the previous owner had been or where the document had been stored. Since forensic document examiners are better prepared to test documents for authenticity today than they were twenty-five years ago, it would be very hard for another Hofmann-type forgery to succeed. Linda Sillitoe and Allen Roberts, Salamander: the Story of the Mormon Forgery Murders (Salt Lake City: Signature Books, 1988), p. 361. E. D. Howe, Mormonism Unvailed (Painesville, Ohio, 1834), pp. 238-239. Howe, Mormoism Unvailed, p. 239. "Mormonism," New Schaff-Herzog Encyclopedia of Religious Knowledge (New York, 1883), vol. 2, p. 1576, as quoted in Joseph Smith and Money Digging, Jerald and Sandra Tanner (Salt lake City: Utah Lighthouse Ministry, 1970), p. 21. David Whitmer, An Address To All Believers In Christ (Richmond, Missouri, 1887), p. 12. Joseph Smith, History of the Church (Salt Lake City: Deseret Book, 1976), vol. 1, p. 20. Letter by Charles Anthon, Feb. 17, 1834, as quoted in Mormonism Unvailed, pp. 270-272. "Utahn Finds 1828 Writing by Prophet," Church News, Deseret News (May 3, 1980): p. 3. Steven Naifeh and Gregory White Smith, The Mormon Murders (New York: St. Martins Press, 2005), p. 110. Amasa Lyman, "The Saints Scattered Abroad," Times and Seasons, vol. 5, pp. 740-742. Sometimes referred to as the RLDS Church, it is now known as the Community of Christ. The Temple Lot Case—"United States Circuit Court (8th Circuit) . . . The Reorganized Church of Jesus Christ of Latter Day Saints, complainant, vs. the Church of Christ at Independence, Missouri . . . Complainant's abstract of pleading and evidence" (Lamoni, Iowa, 1893), p. 37, Utah Lighthouse Ministry photocopy. Sillitoe and Roberts, Salamander, p. 247. Naifeh and Smith, Mormon Murders, p. 154. Dean Jessee, "Joseph Knight's Recollection of Early Mormon History," BYU Studies (Autumn 1976): pp. 29-39. Robert Lindsey, A Gathering of Saints: A True Story of Money, Murder and Deceit (New York: Simon and Schuster, 1988), p. 135. Naifeh and Smith, Mormon Murders, pp. 196-199. Richard L. Bushman, Joseph Smith: Rough Stone Rolling (New York: Alfred A. Knopf, 2005), p. 624. Joseph Fielding Smith, Life of Joseph F. Smith (Salt Lake City: Deseret News Press, 1938), pp. 238-240. Sillitoe and Roberts, Salamander, pp. 340-341. Naifeh and Smith, Mormon Murders, pp. 225-228. Sillitoe and Roberts, Salamander, p. 43. Naifeh and Smith, Mormon Murders, p. 260. Sillitoe and Roberts, Salamander, p. 513. Naifeh and Smith, Mormon Murders, pp. 286-289. Lindsey, A Gathering of Saints, p. 378. Naifeh and Smith, Mormon Murders, p. 514. Los Angeles Times, September 18, 1988, as quoted in The Mormon Church and The McLellin Collection, Jerald and Sandra Tanner (Salt lake City: Utah Lighthouse Ministry, 1993), p. 2. This is now published as part of the Tanners' book, Tracking the White Salamander. Tanner and Tanner, Tracking, pp. 5-6. For further information on McLellin, see William E. McLellin Papers 1854-1880, ed. Stan Larson and Samuel J. Passey (Salt Lake City: Signature Books, 2007). Tanner and Tanner, Tracking, pp. 10-11. Richard E. Turley, Jr., Victims: The LDS Church and the Mark Hofmann Case (Urbana/Chicago: University of Illinois Press, 1992), p. 303. Lindsey, Gathering of Saints, pp. 372-373. See Early Mormon Documents, edited by Dan Vogel, Vol. 1-5, Signature Books; Early Mormonism and the Magic World View, by D. Michael Quinn, Signature Books; The Rise of Mormonism: 1816-1844, by H. Michael Marquardt, Xulon Press; Insider's View of Mormon Origins, by Grant Palmer, Signature Books; Joseph Smith: The Making of a Prophet, by Dan Vogel, Signature Books; Joseph Smith: Rough Stone Rolling, by Richard Lyman Bushman, Knopf. Lindsey, Gathering of Saints, p. 376. Michael De Groote, "Mountain Meadows Massacre affidavit linked to Mark Hofmann," Deseret News (September 7, 2010). Gospel Principles is a doctrinal manual published by the Church of Jesus Christ of Latter-day Saints, the institution of mainstream Mormonism. It was first published in 1978 and has been republished nine times, most recently in 2009. The manual has been standard curriculum for the Gospel Essentials Sunday school class (for investigators and new converts), but for 2010 and 2011 it serves also as the curriculum for the Melchizedek Priesthood and Relief Society classes twice a month. Outsiders learning Mormon theology afresh are better suited starting with Gospel Principles than with Mormon scriptures (KJV Bible, Book of Mormon, Doctrine and Covenants, Pearl of Great Price) or literature authored by BYU religion professors. It functions not only as a concise guide to Mormon theology but also as an example of how Mormonism approaches its own canon. The existence and perpetuation of the book in Mormon culture is a corrective to suggestions that the religion is unconcerned with a holistic, coherent theological worldview. It begins with the nature of God and our pre-mortal existence (chapters 1 and 2) and then ends with final judgment and exaltation (chapters 46 and 47). It explains practical living in the context of a roughly systematic Mormon theology, and gives Mormons a sweeping worldview meta-narrative to understand ultimate reality and their grand purpose in life. In addition to priesthood authority, the main benefits of the "Restoration of the Church" are described as doctrinal truths. Questions provided for readers and teachers encourage theological reflection and practical application. Changes found in the 2009 edition reflect attention to detail. The manual has likely undergone a process of approval by the LDS Church's top leadership. While the book continues much of the theological tradition of Bruce McConkie, notably removed are all references to his book, Mormon Doctrine. Instead of directly referencing older extra-canonical works, the 2009 edition often indirectly references them through recent institutional manuals. According to LDS Church spokeswoman Kim Farah, "Quotes were updated to reference materials that are more accessible to members of the LDS Church worldwide. For example, the series, Teachings of Presidents of the Church, is referenced because it is available in 28 languages, while Mormon Doctrine is only available in a few." This partly gives a sense of just how widely Gospel Principles will be distributed among Mormons worldwide. Its established use as an introductory manual warrants an inspection not only of its content but also of the various changes that have been made to it. At one level the manual assumes a high view of scripture, frequently referencing and quoting verses to substantiate its claims and even providing a list of scriptures at the end of each chapter that imply a basic coherence and general unity of the four books they consider canon. Approximately eighty-nine percent of all references in the main body (excluding the lists at the end of chapters) are canonical. Moses is attributed as the author of the first five books of the Old Testament. Joseph Smith is quoted assuring, "ye need not suppose that one jot or tittle of the prophecies of all the holy prophets shall fail." The Book of Abraham, part of the Pearl of Great Price, is straightforwardly portrayed as "translated by the Prophet Joseph Smith from a papyrus scroll taken from the Egyptian catacombs," leaving no natural impression that the papyri, as some Mormons argue, only served as a catalyst for the revelation of the English text. The Bible is used to support distinctive Mormon teachings, yet the manual still provides members with a basic undergirding for rejecting the Bible when needed. The eighth article of faith is quoted, which functions in Mormon culture to cast doubt on the reliability of the Bible's manuscript transmission history, as well as on the reliability of modern translations. It is implied that we could know more about priesthood organization and government of the Church from the Bible if it had been better preserved. Whereas Louis Zucker, Professor Emeritus of English and Lecturer in Hebrew at the University of Utah, argues that Joseph Smith approached Hebrew in the Joseph Smith Translation like an innovating artist, the manual instead promotes the traditional position that God inspired Smith to restore original meaning. In contrast with the Bible, the Book of Mormon is described as "the most correct of any book on earth" translated "into English through the gift and power of God." Some sections of the Doctrine and Covenants restore "truths that were lost to the world for hundreds of years;" others "shed light on teachings in the Bible." The concept of scripture is not limited to the LDS canon. Readers are told that the "the inspired words of our living prophets become scripture to us. Their words come to us through conferences, the Liahona or Ensign magazine, and instructions to local priesthood leaders." The 2009 edition replaces the phrase "church manuals" to specify the main Church magazines. While for some Mormons "inspired words" constitute the small subset of prophetic teachings which are filtered and vetted against the canon, for mainstream Mormonism this teaching in Gospel Principles has the effect of generalizing General Conference talks and Church magazines as extensions to scripture. This would seem to indirectly help perpetuate the belief among Mormons that living prophets trump the canon, despite statements by leaders to the contrary. That Mormonism goes beyond the canon to support its teachings is reflected by the way the manual supports its own claims. While the manual usually substantiates content with LDS canon, it otherwise misuses its own canon, appeals to extra-canonical statements by leaders as though they carry sufficient weight, or even resorts to making naked, unsubstantiated assertions. necessary step in the plan of life and a great blessing to all of us. Because of the Fall, we are blessed with physical bodies, the right to choose between good and evil, and the opportunity to gain eternal life. None of these privileges would have been ours had Adam and Eve remained in the garden. Readers are asked to ponder the question, "How does the Fall provide opportunities for us to become like our Heavenly Father?" The Great Apostasy is described not only as a loss of "apostolic authority and priesthood keys" but also as a corruption of doctrine. With an implicit reference to the First Council at Nicaea, those who taught that God is immaterial spirit are described as those "called Christians" in "false Christianity" with predominantly "pagan beliefs." They "lost the understanding of God's love for us" and "did not understand the purpose of life." Criticism of historic apostate Christendom remains strong, being only slightly toned down in the newest edition of the book. The Church was organized with the same offices as were in the ancient Church. That organization included apostles, prophets, seventies, evangelists (patriarchs), pastors (presiding officers), high priests, elders, bishops, priests, teachers, and deacons. These same offices are in His Church today (see Articles of Faith 1:6). Important spiritual benefits are exclusive to those who fulfill Mormonism's distinctive requirements. If we "desire the destroying angel to pass us by, as he did in the days of the children of Israel, we must obey the Word of Wisdom [i.e. Mormon dietary laws]; then God is bound, and the blessing shall come to us." Obeying the Word of Wisdom is also described as necessary to enter the temple and retain the Lord's Spirit. Proper ordinances are necessary as well. While a person may be "temporarily guided by the Holy Ghost without receiving the gift of the Holy Ghost. . . this guidance will not be continuous unless the person is baptized [into the LDS Church] and receives the laying on of hands for the gift of the Holy Ghost." The gift is only given by authorized, worthy elders of the LDS Church. Once given the gift of the Holy Ghost, members of the LDS Church can then be blessed with the gifts of the Spirit, such as the gift of tongues, the gift of prophecy, and the gift of working miracles. Couples married in a Mormon temple are also exclusive beneficiaries of certain blessings. "Because we have been married in God's ordained way, we are entitled to an outpouring of the Spirit on our marriage as we remain worthy." In 1992 some rhetoric of perfectionism and earning our final destination was removed. "We would then be assigned to the place we had earned for our eternal home" was updated to, "the place for which we had prepared." "If we prove faithful and obedient to all the commandments of the Lord" was updated to, "If we prove faithful to the Lord." Instead of telling readers to list "some of the blessings that will be given to those who earn exaltation," they are now to list "some of the blessings that will be given to those who are exalted." Complete honesty is necessary for our salvation. President Brigham Young said, "If we accept salvation on the terms it is offered to us, we have got to be honest in every thought, in our reflections, in our meditations, in our private circles, in our deals, in our declarations, and in every act of our lives" (Teachings of Presidents of the Church: Brigham Young , 293). All this is seen in the wider context of bilateral covenants predicated upon our obedience. "The kingdom of heaven is governed by law, and when we receive any blessing, it is by obedience to the law upon which that blessing is based (see D&C 130:20–21; 132:5)." "Even though forgiveness is so abundantly promised there is no promise nor indication of forgiveness to any soul who does not totally repent. . . . We can hardly be too forceful in reminding people that they cannot sin and be forgiven and then sin again and again and expect repeated forgiveness" (The Miracle of Forgiveness, 353, 360). Those who receive forgiveness and then repeat the sin are held accountable for their former sins (see D&C 82:7; Ether 2:15). "My soul hungered; and I kneeled down before my Maker, and I cried unto him in mighty prayer and supplication for mine own soul; and all the day long did I cry unto him; yea, and when the night came I did still raise my voice high that it reached the heavens. And there came a voice unto me, saying: Enos, thy sins are forgiven thee, and thou shalt be blessed" (Enos 1:4–5). The Lord explained to Enos that because of his faith in Christ his sins had been forgiven. When Enos heard these words he no longer was concerned about himself. He knew the Lord loved him and would bless him. Gospel Principles does nothing to correct the tendency of Mormons to divide the atonement into two parts, one in Gethsemane, the other at the cross. While Jesus is said to have suffered "painful death by one of the most cruel methods known to man" at the cross, it is in Gethsemane where "the weight of our sins caused Him to feel such agony that He bled from every pore." He had power over death because he was the "Only Begotten Son of God," which is explained as inheritance of both divine power and mortal limitations. The atonement secures immortality for all, but salvation from spiritual death is only given to those who through faith repent of their sins, are baptized by one holding the LDS priesthood, receive the Holy Ghost, and obey His commandments. Given the descriptions of true repentance elsewhere in the book, one is left with the impression that spiritual death is only truly avoided by those who are someday exalted. The manual continues to use Boyd K. Packer's parable of the debtor and creditor, which shows "how Christ's Atonement makes it possible to be saved from sin if we do our part." A man incurred a great debt and was unable to repay it by the due date. Out of love, and to satisfy both mercy and justice, a friend of the debtor offers to pays the debt to the creditor. Instead of freely cancelling the debt, the friend offers to essentially refinance it: "If I pay your debt, will you accept me as your creditor?" The debtor agrees, and is told, "you will pay the debt to me and I will set the terms. It will not be easy, but it will be possible." Many of the references to "heavenly parents" were taken out in the 2009 edition, but the teaching remains. We are still described as "literally the sons and daughters of God" and as "begotten and born of heavenly parents." We are "sons and daughters of heavenly parents—males and females." We lived "as spirit children with our heavenly parents." Adam and Eve "were formed and given bodies that resembled those of our heavenly parents." Not only that, but in the Grand Council we learned "that if we followed His plan . . . we would become heavenly parents and have spirit children just as He does (see D&C 132:19–20)." Given the eternal importance ascribed to gender and heterosexual family units in Mormonism, this clearly implies not only a Heavenly Mother of our own, but also the potential of females to become heavenly mothers who beget spirit children. The 2009 edition replaces a description of Jesus as "our God and Savior and Lord of the universe" with "the Creator of the earth and our Savior." The 2009 edition also removes the sentence, "We each need to have a personal relationship with him." This is an odd choice. Even though Bruce McConkie counseled that members should "not strive for a special and personal relationship with Christ," the language of having a "personal relationship with Jesus Christ" has gained some acceptance in Mormonism. Even if there is going to be a personal relationship with the Savior, prayer to Jesus is essentially prohibited. "Prayer is a sincere, heartfelt talk with our Heavenly Father. We should pray to God and to no one else. We do not pray to any other being . . ."
The 1997 edition's descriptions of Jesus as "first spirit born to our heavenly parents" and "literally our elder brother" are removed, yet Jesus and Lucifer are described as "both sons" of Heavenly Father. Since we are all described as spirit children of God and spirit siblings to other spirit children of God, the fact that we share a pre-mortal familial relationship with Jesus and Lucifer (and them with each other) is still implied. Language related to exaltation is only slightly changed, and the changes are mostly inconsequential. The phrase "become gods" has been replaced with the euphemism "become like our Heavenly Father," but in other places it remains. In the list of special blessings for those exalted, it is still explicit: "They will become gods." No longer is it stated that God "is not jealous of his wisdom and perfection", yet it is still taught, "He glories in the fact that it is possible for His children to become like Him." The specific promise that spirit children of future exalted gods "will have the same relationship to them as we do to our Heavenly Father" is replaced with the euphemism, "eternal increase." What is meant by extant exaltation language is still outlined by the manual, and dovetails with two other issues: whether God the Father was once a mere mortal who had to progress unto godhood, and whether he was once a sinner like us. That the most relevant content on these issues is in the last chapter of the manual, and especially in the last few paragraphs of the manual, makes for a dramatic ending. Our Heavenly Father knows our trials, our weaknesses, and our sins. He has compassion and mercy on us. He wants us to succeed even as He did. This strongly implies that our Heavenly Father passed the same tests, fulfilled the same conditions, and achieved the same blessings that we can. The chapter describes what some of these conditions are: baptism, confirmation, priesthood callings, temple endowment, eternal marriage, love for God and neighbors, keeping the commandments, repentance, baptism for the dead, church attendance, daily prayers, teaching of the gospel to others, study of the scriptures, and obedience to inspired words of prophets. The blessings are also described: achievement of eternal life, exaltation in the highest sublevel of the celestial kingdom, godhood, living the kind of life God lives, achieving the capacity and role of creator, power, great glory, dominion, knowledge, eternal increase (which includes endless procreation of spirit children), parenthood over spirit children, and unity with righteous family members. The manual's citation from Joseph Smith's King Follett Discourse still includes, "God himself, the Father of us all, dwelt on an earth, the same as Jesus Christ himself did." [see photo right] From this and John 5:19 some Mormons have argued that Jesus was modeling his redemptive ministry after the Father's past redemptive ministry—that God the Father was once a sinless savior for another world. Which view a Mormon takes can be expressed in terms of how they resolve the tension between the phrases "He was once a man like us" and "God . . . dwelt on an earth, the same as Jesus Christ himself did." In other words, it is a question of which parallel is stronger: the parallel between Heavenly Father's mortal experience and ours, or the parallel between Christ's mortal experience and Heavenly Father's. Whichever view a Mormon takes (if any), the Gospel Principles manual is clear: sinful men can repent and succeed at becoming Creators, Gods, and Heavenly Fathers over their own spirit children, with all power, glory, dominion, and knowledge. I use the term "doctrinal" loosely here to refer to authoritative religious teaching. Mormons sometimes use the term in a strict sense to refer to canonical teaching that is binding upon all members. The book was published in 1978, 1979, 1981, 1985, 1986, 1988, 1992, 1995, 1997, and 2009. "Revised Gospel Principles Is Curriculum for 2010," Ensign [The Church of Jesus Christ of Latter-day Saints], Dec. 2009, 79. The LDS Church maintains that the church established by Christ was taken from the earth shortly after the death of His apostles. "The Savior promised to restore His Church in the latter days. . . . On April 6, 1830, the Savior again directed the organizing of His Church on the earth (see D&C 20:1). His Church is called The Church of Jesus Christ of Latter-day Saints (see D&C 115:4). . . . The Lord has said that it is 'the only true and living church upon the face of the whole earth . . .' " Gospel Principles , 96-99. Hereafter GP. "Why is it important for us to understand the nature of God?" (GP, 6) "How have these truths influenced you and others?" (GP, 99). "Explain that Church publications, such as lesson manuals and Church magazines, are produced to help members learn and live the gospel of Jesus Christ. The correlation process helps ensure that these materials are scripture-based, doctrinally accurate, and appropriate for the intended audience. All Church publications are planned, prepared, reviewed, and implemented under the direction of the First Presidency and Quorum of the Twelve" ("Lesson 42: Continuing Revelation to Latter-day Prophets," Doctrine and Covenants and Church History Gospel Doctrine Teacher's Manual, The Church of Jesus Christ of Latter-day Saints, 1999, 243). Contrast GP , 32 with GP , 28, 139 with 122, 266 with 253, and 291 with 243. The manual still quotes Joseph Fielding Smith (GP, 33, 109, 127, 248, 265, 277-278, 279) and Boyd K. Packer (GP, 63-65) as valued theological representatives of Mormonism. Peggy Fletcher Stack, "A new—or is it old?—manual for Mormons," The Salt Lake Tribune, 12/31/2009. A working list of 1997-to-2009 changes is available from Mormonism Research Ministry at mrm.org/gospel-principles, and an evangelical chapter-by-chapter guide is available from the Institute for Religious Research at GospelPrinciples.net. In the main body I counted approximately 796 canonical references, drawn from all four of their books of scripture, and 96 extra-canonical references. "Moses . . . wrote the first five books of the Old Testament. . ." (GP, 41). GP, 253, which is quoting Teachings of Presidents of the Church: Joseph Smith , 252. GP, 48. The introduction to the Book of Abraham clearly identifies Abraham as the author of the text: "The writings of Abraham while he was in Egypt, called the Book of Abraham, written by his own hand, upon papyrus." This theory assumes that the Book of Abraham was not on the papyri; he received the text by revelation, with the papyri acting as a catalyst. This is a possibility because Joseph used the word "translation" to mean several things, including the process of receiving pure revelation. (Joseph Smith's revelations call his revision of the Bible a "translation" (D&C 73:4; 76:15; 90:13; 94:10; 124:89), even though he didn't use any Hebrew or Greek manuscripts. Also, D&C 7 is a revealed translation of a lost record written by the Apostle John.) [link], accessed 3/3/2010. "We believe the Bible to be the word of God as far as it is translated correctly" (Articles of Faith 1:8). "The Bible does not tell us everything about the priesthood or the organization and government of the Church. However, enough of the Bible has been preserved to show the beauty and perfection of the Church organization" (GP, 16). "[Joseph Smith] used the Hebrew as he chose, as an artist, inside his frame of reference, in accordance with his taste, according to the effect he wanted to produce, as a fountain for theological innovations." (Louis Zucker, "Joseph Smith As A Student Of Hebrew," Dialogue: A Journal of Mormon Thought (Summer 1968): p. 53). Mormon apologist Kevin Barney appeals to this imagery in [link], accessed 3/3/2010. "The Lord inspired the prophet Joseph Smith to restore truths to the Bible text that had been lost or changed since the original words were written" (GP, 46). GP, 115 reads, "When we place our faith in Jesus Christ, repent, and are baptized, our sins are forgiven through the Atonement of Jesus Christ." Shortly after, it quotes D&C 20:37 using an ellipsis that hides a teaching which would probably surprise most Mormons readers: the remission of sins is a prerequisite to baptism. See for example the substantial citation in GP, 63-65 of Packer's atonement parable or the appeal in 279 to the controversial King Follett Discourse. See for example GP, 92 where the Great Apostasy narrative is supported with an appeal to the corruption of the Emperor Constantine, a connection nowhere made in the LDS canon. "Soon pagan beliefs dominated the thinking of those called Christians. The Roman emperor adopted this false Christianity as the state religion. This church was very different from the church Jesus organized. It taught that God was a being without form or substance" (GP, 92). For example, the following was removed: "Church officers were given honor and wealth. Bishops and archbishops fought among themselves to gain more power" (GP , 106; cf. GP , 92). Contrast GP , 105 with GP , 92. Contrast GP , 102 with GP , 89. Contrast GP , 111 with GP , 97. Contrast GP , 101 with GP , 87. Teachings of Presidents of the Church: Heber J. Grant , 192, as quoted in GP, 171. "We must obey the Word of Wisdom to be worthy to enter the temple. If we do not obey the Word of Wisdom, the Lord's Spirit withdraws from us" (GP, 167). Contrast GP , 289 and GP , 301. Contrast GP , 290 and GP , 302. Contrast GP , 291 and GP , 303. GP, 204. See also GP, 81: "Within the gospel, a covenant means a sacred agreement or mutual promise between God and a person or a group of people. In making a covenant, God promises a blessing for obedience to particular commandments. He sets the terms of His covenants, and He reveals these terms to His prophets. If we choose to obey the terms of the covenant, we receive promised blessings." Cf. Spencer W. Kimball's The Miracle of Forgiveness (Bookcraft [acquired by Deseret Book], 1969), 208, and Faith Precedes the Miracle (Deseret Book, 1972), 180-181. 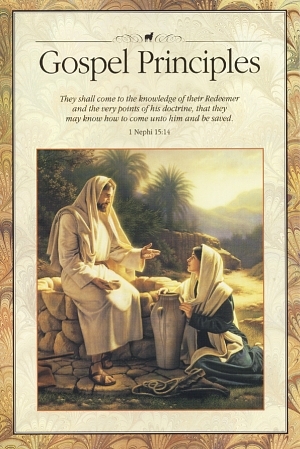 As of March 2010 The Miracle of Forgiveness continues to be sold in official LDS Distribution Centers, even though the book is published by Deseret Book and not the LDS Church. GP, 231. Cf. Miracle of Forgiveness, 354: "[Alma 13:11-12] indicates an attitude which is basic to the sanctification we should all be seeking, and thus to the repentance which merits forgiveness. It is that the former transgressor must have reached a 'point of no return' to sin where there is not merely a renunciation but also a deep abhorrence of the sin—where the sin becomes most distasteful to him and where the desire or urge to sin is cleared out of his life." The implication of Kimball's harsh standard of repentance is often expressed in contradictory but complementary ways: A sin is never really truly forgiven until a "point of no return" is reached, but if the sin is repeated, prior forgiveness is considered nullified. While all parts of the atonement are viewed as integral to accomplishing the fullness of salvation, payment for sins and vicarious experience of cumulative human suffering is generally placed by Mormons in the garden, while the securing of resurrection for all is seen as accomplished by Christ's death and resurrection. Neither early Mormonism nor the Mormon canon shares this approach to dividing the atonement. "Jesus is the only person on earth to be born of a mortal mother and an immortal Father. That is why He is called the Only Begotten Son. He inherited divine powers from His Father. From His mother He inherited mortality and was subject to hunger, thirst, fatigue, pain, and death" (GP, 53). The hellish state of many in heaven (especially those in the telestial and terrestial kingdoms) seems lost on many Mormons, but some leaders have recognized it: "Eternal damnation is the opposite of eternal life, and all those who do not gain eternal life, or exaltation in the highest heaven within the celestial kingdom, are partakers of eternal damnation. Their eternal condemnation is to have limitations imposed upon them so that they cannot progress to the state of godhood and gain a fullness of all things" (Bruce R. McConkie, Mormon Doctrine, 1966, 234). GP, 63. Emphasis in the original. Compare GP , 11 with GP , 9, and 13-15 with 10-11, 17 with 13, 19 with 16, 231 with 207. "Each is a beloved spirit son or daughter of heavenly parents, and, as such, each has a divine nature and destiny. Gender is an essential characteristic of individual premortal, mortal, and eternal identity and purpose" ("The Family: A Proclamation to the World," Ensign [The Church of Jesus Christ of Latter-day Saints], Nov. 1995, 102). Compare GP , 191 with GP , 166. "Building a testimony on the foundation of a sincere, personal relationship with our Heavenly Father and His Beloved Son, Jesus Christ, and on our faith in them, should be our highest priority" (Joseph B. Wirthlin, "Spiritual Bonfires of Testimony," Ensign [The Church of Jesus Christ of Latter-day Saints], Nov. 1992, 34). "The most important thing we can do—young or old—is develop a personal relationship with Jesus Christ" (W. Don Ladd, " 'Make Thee an Ark,' " Ensign [The Church of Jesus Christ of Latter-day Saints], Nov. 1994, 28). Contrast GP , 11 with GP , 9. "After hearing both sons speak, Heavenly Father said, 'I will send the first' (Abraham 3:27 [Pearl of Great Price])" (GP, 15). "Every person who was ever born on earth is our spirit brother or sister. Because we are the spirit children of God, we have inherited the potential to develop His divine qualities" (GP, 9). Contrast GP , 245 with GP , 223. "Those who inherit the highest degree of the celestial kingdom, who become gods, must also have been married for eternity in the temple (see D&C 131:1–4)" (GP, 272). Contrast GP , 302 with GP , 277. Contrast GP , 305 with GP , 279. GP, 275 references D&C 131:1 to support the notion of three sublevels in the celestial kingdom. Mormon apologist Kevin Barney contests this traditional interpretation by explaining that "celestial glory" in the passage probably generically refers to heaven and not specifically to the celestial kingdom. See "Is the Celestial Kingdom Divided into Three Subdegrees?" [link], March 18, 2006, accessed March 6, 2010. GP, 275. See also GP, 11: "We would be resurrected; we would have all power in heaven and on earth; we would become heavenly parents and have spirit children just as He does (see D&C 132:19–20)." In my experience about two-thirds of Mormon laymen affirm God the Father was perhaps once a sinner. About one-third of Mormon laymen deny it, the dominant explanation being the sinless-savior theory. This diversity is reflected in my video interview project, www.GodNeverSinned.com. [O]pinion is divided as to how closely the Son's career paralleled that of his Father . . . These and the Prophet's earlier remarks are believed by some to infer that our God and his father once sacrificed their lives in a manner similar to the atonement of Jesus Christ. It is argued that the Prophet's words suggest that these gods did not simply live and die as all men do, they 'laid down' and 'took up' their lives in the context of sacrifice . . . This extrapolated doctrine rests upon a somewhat inadequate, if not shaky, foundation. Indeed, it is highly doubtful. The basic process of laying down and taking up one's life is similar for all even though it is not identical for all ("The Doctrine of the Firstborn and Only Begotten," in The Pearl of Great Price: Revelations from God [Provo, UT: Religious Studies Center, Brigham Young University, 1989], 91-117). Also see Joseph Fielding McConkie, and Craig J. Ostler, Revelations of the Restoration (Deseret Book, 2000), KFD 5:1. Italics added to quotes for emphasis. Heavenly Father Was Once a Man? One of the problems encountered by those desiring to compare LDS theology with standard Christian theology is determining what constitutes "official" LDS doctrine. For a number of years the LDS Church has been editing its books and church manuals to de-emphasize the more radical parts of its theology. Some observers had hoped that this signaled a move to a more standard Christian theology. However, even after editing, the aberrant doctrines are still sprinkled throughout their instruction manuals. Traditionally Christians have maintained there is only one God, who has eternally existed as God, following the teachings of the Bible (see Deut. 6:4; Isa. 43:10-11; Isa. 44:6; Isa. 44:8; Isa. 48:11-12; Malachi 3:6). On the other hand, since the days of Joseph Smith, the LDS Church has taught that God the Father was once a mortal who advanced to godhood. This, of course, would necessitate another god who oversaw our Heavenly Father's progress to godhood. The following quotes, gathered from current LDS scriptures and teaching manuals, are taken from www.lds.org. These manuals clearly establish that the LDS Church is currently teaching that God the Father was once a mortal on another earth, that he and his wife are resurrected beings who progressed to godhood, and that mortals on this earth are their literal spirit children, with the same capacity to progress to godhood.
. . . if a man marry a wife by my word, which is my law, and by the new and everlasting covenant, . . . they shall pass by the angels, and the gods, which are set there, to their exaltation and glory in all things, as hath been sealed upon their heads, which glory shall be a fulness and a continuation of the seeds forever and ever. Then shall they be gods, because they have no end; therefore shall they be from everlasting to everlasting, . . . Then shall they be gods, because they have all power, and the angels are subject unto them. And worlds without number have I created: and I also created them for mine own purpose; and by the Son I created them, which is mine Only Begotten. 2 . . . and the Spirit of the Gods was brooding upon the face of the waters. . . .
Teachings of Presidents of the Church: Joseph Smith, 2007. Teachings of Presidents of the Church: Brigham Young, 1997. Teachings of Presidents of the Church: John Taylor, 2001. In one point of view, man appears very poor, weak, . . . In another point of view, we look at him as emanating from the Gods—as a God in embryo—as an eternal being who had an existence before he came here . . . He [man] is a God in embryo, and possesses within him a spark of that eternal flame which was struck from the blaze of God's eternal fire in the eternal world, and is placed here upon the earth . . .
Teachings of Presidents of the Church: Heber J. Grant, 2002. Teachings of Presidents of the Church: Spencer W. Kimball, 2006. In order to reach the goal of eternal life and exaltation and godhood, one must be initiated into the kingdom by [LDS] baptism . . . endowed and sealed in the house of God by the prophet . . . and one must live a life of righteousness . . .
Doctrines of the Gospel: Student Manual, Religion 430 & 431, 2004. "The Church of Jesus Christ of Latter-day Saints, basing its belief on divine revelation, ancient and modern, proclaims man to be the direct and lineal offspring of Deity. God Himself is an exalted man, perfected, enthroned, and supreme. . . .
Doctrines of the Gospel: Teachers Manual, Religion 430 & 432, 2000. May 2010: The Salt Lake City Messenger has been real blessing in my life. Especially for this ex-Mormon. May 2010: I was born & raised a Mormon in Salt Lake. I never cease to marvel at how "different" life in Christianity is. . . . Anyway—thank you for helping so many of us. May 2010: Many years ago your "Mormonism—Shadow or Reality?" was the beginning of my withdrawal from Mormonism. I've always been grateful. May 2010: PLEASE<PLEASE>PLEASE don't let this be my last newsletter, I love (but confused) reading your newsletters. I've been a LDS person since before birth. I'm just now finding myself with questions and I didn't even know I had questions. 50 years old and always been follower, never a thinker. I am enjoying the info that i know will help me break away from my LDS church and find the true church where I belong. May 2010: I have been reading your newsletters and literature for years ever since we had Mormon neighbors move in across the street. They have since moved back to Utah where it was safer. Our daughter, however, wanted so badly to be married that she married a not very active Mormon man, so perhaps all the knowledge we've accumulated in our house will help them some day, I pray so. May 2010: I was baptized LDS in 1949 and excommunicated at my insistence in 1999. . . . The more engaged a person has been with Mormonism, the more he or she will appreciate your always painstaking labor in deconstructing the massive deception that organization represents. May 2010: I thank God that I escaped [Mormonism]. I knew what that would mean with regard to my LDS children. Never the less I'm glad to be free. . . . God bless you. May 2010: I'm 90 yrs old. 12th in my LDS family. . . All my six children have received Jesus as lord as have all my 17 grandchildren. May 2010: I was born and raised in Mormonism, a descendent of polygamists in southern Arizona. I finally heard the simple gospel of the Bible and received Jesus into my heart as my savior and my righteousness . . .
June 2010: I made two attempts to read the two books that I ordered. Both times I felt the gathering of very dark, heavy energy around me. . . . I threw the books away . . . please take my name off your mailing list. June 2010: I very much enjoy reading your articles on the actual history of the Mormon church, Joseph Smith, its other leaders, and their shifting doctrines and would hate to see it go missing from my mailbox! July 2010: Just curious why you have a whole website trying to discredit the Mormon church. Seems very unchristian and with all the hate in the world, it seems like hating other Christians is wrong. July 2010: I would like to continue to receive your newsletter. (Joseph Smith: The Early Years was riveting!) I am a life-long Christian and professional historian . . . and I have long used ULM for academic evidence to show how fraudulent Mormonism is. . . . Thanks for the work you do. It is really fine, and holds up completely to the scrutiny of any honest professional historian. August 2010: Why don't you guys focus on something productive rather than trying to take down other peoples believes? I'm not a religious type but you guys are f....d up and just as bad as racists. August 2010: You probably wouldn't remember me, but I received my Ph.D. . . . from the U in '95. I now teach at . . . University in Virginia. You and Gerald made a huge impact on me and my wife (ex-LDS). May God continue to bless you and your ministry. August 2010: I think someone in the LDS church hurt you and you have allowed it to fester and now you can [not] let go and all this hate inside you is coming out because it is the only way you know how to handle your emotions. All I know is that I am saved by the grace of God and I still enjoy going to the LDS church. August 2010: It is comforting to us to know that someone (yourself with Dear Jerald), who has meant so much to our own lives in Christ Jesus, is still doing pretty good in this temporal part of our life, here on earth. . . . You just keep right on "hanging in there" in FAITH. . . . we withdrew from Mormonism, and DREW INTO JESUS. August 2010: Perhaps I owe my deepest heart felt thanks to Sandra Tanner for helping me realize just how much I love the LDS church. . . . Reading your website the hate and anger you feel for the LDS church is so strong, I don't know what to say. I would say I feel sorry for you but I know you won't care. August 2010: It's funny I remember hearing about your publications when I was in high school mentioned with dismissive disapproval. Now that I have read several of your books and papers, I have found nothing unfair or undocumented, if anything you are too kind. I can only faintly imagine from my time asking pointed questions at BYU what it must have been like living in SLC Utah doing your work. That could not have been fun. August 2010: [From a Mormon] I am just exposing you for what you really are . . . a fraud with so much hate in your heart that you have to tear people down. Step back and ask yourself, would our Lord and Savior Jesus Christ be proud of what you are doing???? August 2010: I used to be mormon . . . the research on your website has been a huge help to me personally and I started reading it as part of the process leading to me being Saved! thank you for being an instrument in the hands of our all loving Amazing Wonderful God! August 2010: [From a Mormon] Do you really have everything you need in life??? You seem to be unfulfilled . . . I can help you. . . . First, let me ask you a few questions. . . . How was your childhood???????? . . . We can heal you from all your hate and get you onto a path of inner peace and free you of all the demons in your life. August 2010: Thanks to the holy spirit and dedicated people like you I have been a christian for 10 years. August 2010: I have ordered many books from your website and have found them useful to me in understanding what was left out of the church history and why so many things never quiet added up. I want to thank them for providing such a service to me personally and I'm sure thousands of others. Being able to see this information has helped put my mind at ease and is helping me move on. August 2010: So why can't you just leave us alone. I'm happy knowing that I attend a church that has the same values as I do, so why all the hate??? You must be a very miserable person that has devoted a lot of time on hating the LDS church, I only wish I had that kind of time. September 2010: I was a member of the mormon church for 20 years. When I found out many hidden facts about the mormon church I decided to resign. September 2010: I live in Orange County, CA. I have watched a few of the wonderful YouTube videos of Sandra Tanner speaking . . . I have a heart for those who come witnessing at my door . . . and your videos have helped out a lot. September 2010: [From a prisoner] Thanks so much for the books you sent me. The insight I have gained is Heartfelt. As I stated before, when first coming to prison, I was Mark Hofmann's neighbor; we would . . . play chess together although I almost never won! Through the course of my stay, I have ran across (get this) 3, self proclaimed Prophets, Dan Lafferty, John Chenney and Warren Jeffs . . . Small World! September 2010: I am a Mormon from . . . Canada that during the midst of my own research discovered the church to be not what it claims and in that process discovered Christ and accepted him as my Lord and Savior. That said however I am still currently a member although under an official written gag order by my Stake President in regards to remaining quiet about historical issues. But my research continues, especially in finding photocopy evidence of early documents, letters and diary accounts. September 2010: Sandra, I am so thankful for all of the work you have done to help bring awareness about Mormonism. I was devout til age 35 and your work, among others, was instrumental in helping me sort out fact from fiction. After 7 years of heartache and soul pain, I was finally able to feel at peace, and happier and more alive than ever in my life. I am FREE! September 2010: Four of my 5 children and myself, have been saved by the blood of our Great God and Savior, Jesus Christ. My eldest was baptized, along with his wife and family, as well as their new baby dedicated to the Lord, last Sunday at our home church . . . My children's dad—a staunch LDS believer—was there and it was his first experience hearing a Christian service. Pastor . . . preached a dynamite sermon on the Trinity and my son. . . . (age 18), was hoping that his dad was as touched by the Holy Spirit as we all were. He brought up the sermon, as well as a recent letter he'd written to a friend, to his dad later in the day. He ended up frustrated and sad at the thought of his dad's hardness of heart—they ended the conversation by the typical "You've only strengthened me in my beliefs" comments from his dad. The other issue with [my son] is that the rest of us have all written exit letters to the church and have been bugging [him] to do the same. Although he is a follower of Christ, he has never really felt an urgency to do so. Your insights about the first Christian service you attended struck a chord with me, and I forwarded the clips to [my son]. He watched in its entirety and sent me the response, below. You should also know that his exit letter was in my inbox this morning, too. Sandra, thank you so much for all you do. You have been an instrument of the Holy Spirit in all of us being led to the "Amazing Grace" of Jesus Christ. Keep up the great and mighty work that God is doing through you. Email from her son: This was a really awesome clip. I'm glad you sent it to me, she [Sandra Tanner] really got me with the one foot in one foot out thing. I want completely out. Then I want my letter to be framed. Also the part where she talked about just being a part of someone's growth in Christ, I just want to be a part of it I know I can't be all of it. I just hope I get to see the outcome sometimes! I love you Mom, thank you for helping me to see Christ. September 2010: I left the Mormon Church in the late nineties after reading material from UTLM. Grateful to God for His work through your life and ministry.